Made entirely from certified biodegradable materials, this fully compostable paper cold cup is a viable replacement for traditional paper and foam cold cups. Custom branding is also available so foodservice retailers can promote sustainable business practices, one cup at a time. New PLA-lined cold cups use a plant-based Ingeo™ lining to provide leak-proof performance. We’d like to see more foodservice retailers and any business that currently offers paper cups make the switch to these Earth-friendly paper cold cups. 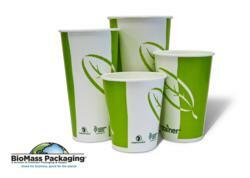 BioMass Packaging®, a division of Excellent Packaging, innovator and wholesale distributor of sustainable, biodegradable, and nature-based packaging for foodservice and other applications, has broadened its range of bio-friendly alternatives to foodservice staples with the addition of new paper cold cups manufactured from renewably sourced paper fibers. The new cups look and perform just like regular paper cold cups, but are completely sustainable because they are entirely sourced from renewable resources. Eschewing the polyethylene that is normally used to line paper cups, these new PLA-lined cold cups use a plant-based Ingeo™ lining to provide leak-proof performance. When used in conjunction with an Ingeo-based lid and straw, any soft drink vendor can now offer its customers a fully compostable serving solution that enables diversion of cold cups from the landfill — where billions of paper and foam cups end up every year. To jump-start sales of the new cold cup, BioMass Packaging is offering a ten percent discount on all orders placed before the end of May 2012. Custom printing is also available. “We hope these cups put the nail in the coffin of polystyrene foam cups,” added King. Available in 12-, 16-, 22-, and 32-ounce capacities. The new ecotainer® cold cups are available for immediate delivery directly from BioMass Packaging, or from the company’s BiomassPackagingStore.com online store. To learn more about the comprehensive range of bio-based, sustainable foodservice packaging products offered by Excellent Packaging, or to enquire about volume pricing, call (800) 317-2737 or email sales@excellentpackaging.com. A PDF-format brochure is available online. BioMass Packaging specializes in offering sustainable packaging solutions for foodservice operators that want to reduce their impact on the environment.